One side of John Lewis’s (“never knowingly undersold”) fronts bustling Oxford Street with its rabbits that dart on and off the buses to do their shopping. The other side of John Lewis backs onto a little oasis of calm, a green park in Wigmore Street. Cavendish Square is open (unlike the private squares of Bloomsbury) but mercifully it is spared a pounding from multitudinous feet. There some nuns set up a free school for poor children, which they financed by setting up a paying school for well-off children. The convent was bombed during WW2; after the war, architect Louis Osman was called in to restore No.12 and create a linked bridge with No.13. Osman had an idea for the facade of the bridge: a statue of the Holy Child would “levitate” against the facade, and it would have to be cast in lead – the roofing from the bombed building. He assigned this commission to Jacob Epstein. Naturally the prospect of a Jew creating a Christian icon raised some opposition, but Louis Osman backed his man. So, with great fair-mindedess, the Mother Superior interviewed Epstein about his views on a religious work. The happy resolution of this “clash of cultures” reminds me of the tribute, from a Hindu lady physician to Mother Theresa of Calcutta: “We may have differed on principles but when it came to the health of the child, Mother was right there”. The Convent of the Holy Child found that, when it came to doing a religious work, Jacob Epstein was right there. Their Mother Superior requested only that the face be changed to give the Virgin a more serene expression. And quite right too, a most happy suggestion. Artists have mannerisms, and Epstein’s mannerism is to lay it on a bit thick: “a look of suffering is the badge of all my works” . 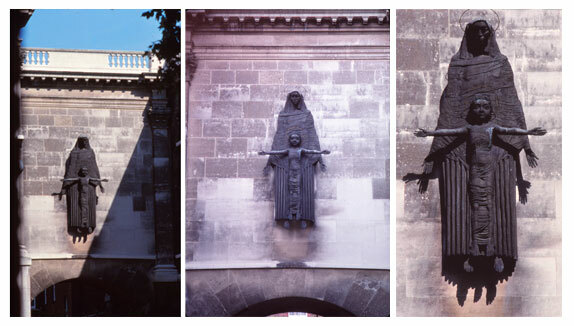 So there they stand, Virgin Mother and Holy Child – three tons of lead suspended against a brick wall; you can see them through the archway (figures 12 to 16). The slanting shadow of the moving sun accentuates their placing. Epstein took great care with the architectural relation of his projected works to their environment. In this respect he was continuing the tradition of the ancient Greeks who, as an expression of civic pride, took great care in the placing of a temple in relation to the city, the hills and the sea; and took equal care over harmonious relations between the temple and the statues within it. Technically, Epstein has come up with a brilliant solution to his architect’s demands that the statue should (a) seem to “levitate” and (b) be made of lead – an absurd contradiction at first sight. He has made the figures very flat: this reduces their weight as viewed, and makes them seem to flit over the surface like the shadow (figure 12). Artistically, he accentuates their flatness by conceiving the figures in a hieratic style which has not been seen in Western Europe since 1300, when Dante noted that his realistic painter friend, Giotto, had supplanted Cimabue, painter of icons, in fame. The early Christian painters, it has ofter been remarked, were not ignorant of perspective – they rejected it deliberately, because they were using appearance to denote a reality beyond appearance. Strangely enough, Michelangelo also began to reject perspective in his final religious paintings: the Last Judgment, the crucifixion of Saint Peter and the conversion of Saint Paul. “Time and Space may be illusions”, says one mathematical physicist. The little boy’s outstretched arms form a perfect cross, and his eyes with their deeply drilled pupils exercise an hypnotic intensity inside their perfectly circular sockets; intensified to the second degree by a perfectly flat halo – a halo with a cross inside, like a gunsight. His hair radiates like flames in the sun’s corona; this little genius born to be the Light of the World; this baby cradled in a manger who, like science, came into the world so quietly and then shook it. Over her child broods the mother. Her face is quiet but watchful. What genotype, what phenotype is she? Her boy looks Hindu. There is a touch of Bantu in her thick lips, a touch of the Sahel in her long triangular chin, a touch of Indo-European in her big straight nose, a touch of the Semite in her receding forehead, a touch of the Tartar in her high cheek-bones and her broad temples. And here did she get those large, heavy-lidded eyes? She is the universal Mother of the Christian god, of its Church which calls itself Catholic because its founder instructed His disciples to go out into the whole world (kata holos) and bring the good news to “all sorts and conditions of men”. Epstein must have found an extraordinary model for this face; or else, I guess, he extracted a synthesis from his unusually large vocabulary of forms. He used to haunt the museums of London and Paris, and he assembled the largest collection of African art in Britain. Yet his Virgin is no mere composite nor generalised symbol; she is an ordinary young mother, you can meet her in any market place, she has a child to look after, there is a determined set around her mouth. Time and Space might be an illusion to mystics and mathematical physicists, but they are no illusion to the flesh that is born to move to its destined end. The little boy is not yet ready for his bar-mitzvah, when he will go to Jerusalem and astound the rabbis in the great temple with his learning. He radiates an unusual power, and his mother is a little in awe of her wonderful child; but neither of them dream that a day will come when he will go down to the Sea of Galilee and train fishers of men, and preach the most revolutionary manifesto ever; that a time will come when and people will journey from afar to hear him and be healed, even from Jerusalem, even from Lebanon across the border. “Time in the mercy of its means” leaves them blissfully unaware of all that will follow. All is still. May the bombs not fall again on this blessed spot. Thank you for your essay. I was a student at Cavendish Square at the time of the rebuilding of the bridge and the installation of the sculpture. I saw the comings and goings of Epstein and was aware of his discussions with Mother Superior. The Sisters of the Holy Child were outstandingly highly educated women, and several known to me were members of families famous in literature and art. I watched the unveiling of the statue, and on the same day in the late evening I watched from my room which overlooked the mews as Epstein came back alone and stood contemplating his work. A fabulous essay and a wonderful response. So happy to have stumbled on these. I too was a student at the school Alastair, & my twin Margery Anderson. (Identical twins) In spite of my name I was a girl (Alastair) and am now called Allie. The nuns were wonderful and yes highly educated and artistic. Our fellow twin friends were Rachel Roberts and her twin. I have forgotten her name. We were at the school when Epstein created the statue and were at the unveiling ceremony . In fact my late aunt & uncle had works by Epstein as they were collectors of his work. I was thrilled to read about the work by Epstein in Cavandish Square. A fascinating article which makes me want to go back to see the sculpture when I go back to London, from Italy where I live. I am a nephew of the artist as I am the son of a sister of Kathleen Garman , model and wife of the sculptor. You can look African, Asian, European and well, Indian. But how do you look Hindu? Does the Pope look Catholic?